Responding to a recent article in the Phuket Gazette entitled “Thailand receives ranking upgrade combating IUU fishing” the Environmental Justice Foundation warns the Royal Thai Government still has a long-way to go to ensure the long-term sustainability of its fisheries. While the Environmental Justice Foundation (EJF) recognises the significant progress the Royal Thai Government (RTG) has taken to tackle failings in its fisheries management, the reforms and measures currently in place remain insufficient to eradicate illegal fishing and slave labour in the country’s seafood sector. Following its European Commission “yellow card” warning in 2015, the RTG introduced several reforms, including updated fisheries legislation, improved vessel monitoring and inspection regimes and efforts to address the trafficked, bonded, forced and slave labour associated with overfishing and illegal fishing. 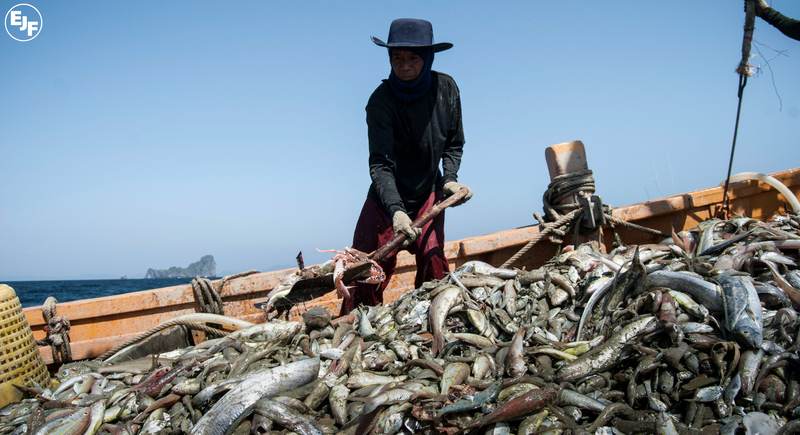 However, as laid out by EJF’s recent analysis of the fisheries and human rights situation in Thailand, including our most recent report and film, Thailand’s Seafood Slaves, as well as previous statements issued in October and December 2016, there is currently no evidence to suggest that a “green card” would, or should, be warranted. The urgent and effective decommissioning of fishing vessels to address the overcapacity of the Thai fishing fleet which has been a huge driver of illegal fishing in the region. Such a programme would need to be based on a transparent and independently verified calculation of the maximum level at which Thai waters can sustainably be fished. The expansion of tamperproof vessel monitoring systems and unique vessel identifiers to ensure coverage of the majority of Thai commercial vessels - those 10 GT and above in size - to strengthen transparency and traceability in the sector. The strengthening of at-sea and port inspections to ensure they are coherently applied across the country, taking a risk-based approach and are victim-centred, including ensuring the required translation capacities to communicate with a predominantly migrant crew. The ratification and full implementation of ILO Conventions C188 Work in Fishing, C87 Freedom of Association, C98 Collective Bargaining, as well the urgent amendment of Articles 88 and 101 of the 1975 Labour Relations Act (LRA), which still legally prevent migrant workers from creating labour unions or holding leadership roles in unions. EJF believes that the Thai government is able to address these issues if it continues its current path of reforms in the long-term and expands them to address the drivers and underlying causes of illegal fishing and slavery. This will require additional, substantial efforts to improve Thai fisheries and further collaboration regionally and globally to build and apply policies and instruments to fully eradicate these issues.